Well, it finally happened: I got sick in Guatemala. However the culprit was not Monteczuma's Revenge, it was dehydration. In an attempt not to make a bad situation worse, I called the teacher in charge of the trip and explained my situation. He suggested that I take the day off from school and rest. I did so until my rest was interrupted by a town official who had been notified about my predicament and delivered three bottles of electrolyte fluids. Think of it like Pedialyte for adults. It worked wonders and I was able to return to my normal activities today. Today's school day was shorter than usual as the principal dismissed the students early so that the teachers could have time to enjoy some fellowship before rushing off to their second job. In the United States, school-sponsored fellowship usually involves sandwiches or donuts. In Guatemala it means a multi-course meal consisting of soup, chicken, steak, rice, corn, cake and of course, tortillas. 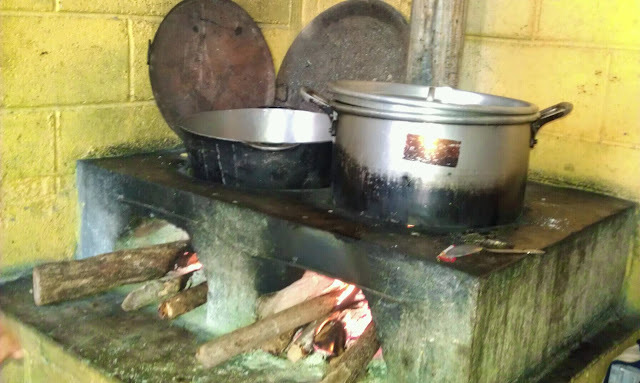 All of the food was prepared by the teachers on the school's wood-burning stove (see picture below). Friday is going to be my last day at the school and I would like to acknowledge the kindness that the students and teachers have shown me. I am not one to cook a multi-course (or frankly any) meal, so I visited the local bakery to order cookies and pasteries. Since the school is located on the edge of town, I inquired about delivery service and offered to pay extra for it. This led to several minutes of confusion which was luckily resolved after a bi-lingual business owner intervened. I think I finally know how many of my students feel on a daily basis. It was a relief when I flagged down a random tuk-tuk to take me back to the hotel and the driver happened to know my name and where I was staying with no need for me to communicate that information to him in Spanish. You are very brave. I am not sure I would have the courage to go to another country and teach, even though I love my EL students. I put a lot (maybe too much) thought into this trip before I decided to book the plane ticket. It was a bit out of my comfort zone, but I'm glad that I had the experience.